The four films fit inside a beautiful outer box that is think and durable. 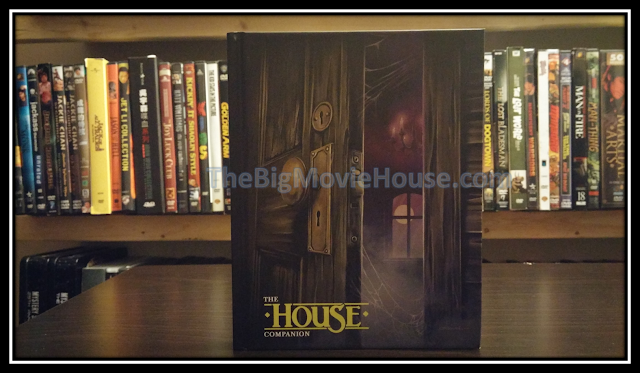 The cover art is really nice, showing the hand from the first film opening the door to a house. The back of the box gives all the information found on the individual cases as well as the info about the box set itself. Inside the box are the four blu-ray cases for the films themselves, but there is also a hardcover, 148-page book that covers all four films. The book is a combination of original material written by Simon Barber and press materials. The book is beautiful. The fact that it is a hardcover book blows me away, but what really sells it is the material inside. Barber writes about his favorite series with a passion and a gusto that is not seen that much in modern film writings. He doesn’t care what other’s opinions are, he just wants to share his love of the House series with everyone. The pages of the book are full color and glossy, giving a lovely box set that much more elegance. See individual releases for reviews of each film. Arrow has done a bang up job with this box set. Yes, the films are a bit underwhelming, except for the last one which is a tragedy, but Arrow put a lot of effort into this set and they should be commended for it. Any other company would have released the films with the less features and A/V quality would have been really bad. There would have been no book and the retail price for one film would have been close to the selling price of this set. The framing issue in the first film is a problem, but I believe that it is something that can be looked past. The rest of the films look great and the sound for each is good. The special features are outstanding, with the exception of House IV. All in all this is a great set and one that should be picked up by more people.